This weekend showed a glimpse of Spring in New England--longer, warmer days...nevermind that it may not reach 20F tomorrow. 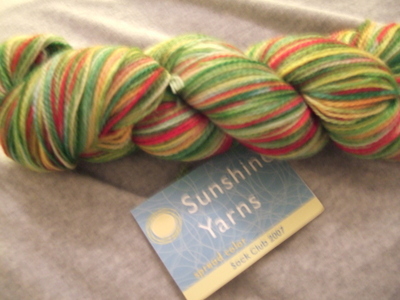 On Saturday my first installment of Sunshine Yarns 2007 Sock Club arrived! Dani was inspired by farmers' market produce to create this color named "Fresh." A nice preview of the vegetables I am looking forward to this growing season. It feels great to support a local artisan (and super to get a surprise yarn package in the mail). I'm also very fortunate this year to be able to split a coveted Appleton Farms CSA Share. Starts in June! In the meantime, anyone have suggestions on a pattern for Fresh socks? p.s. Still no entries on the button contest. Don't be shy, I'll feed you yarn!